Best Game Recording Software: In the entertainment era, games occupy a significant place in the internet world. It can be GBA games, RPG games, browser games, good old mario games, FPS games, or online multiplayer game. You can just download the game and start playing it. At some point, you need some kind of instructions or tricks to complete the level in the best way. Those tricks or tutorials are made by games themselves, just like you. Here, we come up with the similar game video recording tools. With these, you can record perfect gameplay footage. Here we are with the top 10 tools available on the internet to let you record your game while you play it. It’s a free and versatile tool which helps in recording full-frame video gameplay with a selection of codecs, frame size options, etc. Afterburner is a little complicated and requires some time to understand. It’s best for capturing ultra high resolution screen using Nvidia DSR, which ShadowPlay won’t do. It is an overclocking utility. When all else fails, see if it works. With the concept of game recording taking itself to a new level of usage among gamers, Microsoft Corp. decided to step in with its Windows 10 pre-packed game recording tool called Game Bar. So, if you have got Win 10 on your system, you need not go anywhere else. You better try out this simple tool first. Simply press Windows Key + G while your game is running and you will get this blue colored smallish bar at the center bottom and you are good to go. Simply click manually provided buttons or press Windows Key + Alt + R to start or stop the recording. You can select quality of the video, “Standard” and “high” and the audio recording can also be customized with the options of choosing bit rate. It has a recording threshold of just 30 seconds. Press Win Key + Alt + G to recover the recording of the last 30 seconds. It is easy to use, offers great video quality, but lacks many customization options. This is more of a screen recording software, but thanks to its capability to get stuff at high quality, it can be easily used to record your games. You will be having different video formats to choose from including MP4, WMV, MPEG, AVI, etc. Along with windows, WM Capture is also available for Mac OS. The interface is really very simple and user friendly and add to that the useful feature of taking screenshots at multiple frame rate! It is worth a try. The setup is dead easy. Key Features: Customizable capture windows, take screenshot of video frames and save video to multiple formats. Pricing: Free trial and a license for $39.95. Compatibility: Windows XP, Vista, 7, 8, 8.1, 10 and Mac OS X. Related: How To Take A Screenshot on Windows. The name sounds an interesting stuff, isn’t it? It works even better. This small 3 MB+ tool does the magic with least bit of frills attached with it. Straight and simple, that would be the verdict of our experts for this game recorder. It can capture videos at 7680×4800 resolution with custom frames that can be adjusted anywhere between 1-120 fps. This one also tells you some of the statistics of your game like your performance, average performance rate, fps recording rate and hence, it can also be used as a benchmark tool. It can save the data for future reference. Key Features: Light software, Benchmark tool and High quality video with customizable frames. Pricing: Free version with limited features and full version available for a price of $37. Compatibility: Windows XP, Vista, 7, 8 , 8.1 and 10. Check: Fix 403 Forbidden Error. The biggest advantage of using Dxtory is that you have got the option of recording from multiple audio sources i.e. from both your game and the microphone. And on top of that, you later get these audios as two different timelines and can edit them accordingly to give instructions if you are recording for a tutorial. The interface is robust and very easy for a newbie to understand and that is what makes it an attractive option. Its free version has got all the features, the only catch being that you will have to bear with its watermark on the videos. Video settings includes video codec, frames per second (fps) from 10-120, sources, size and format. Key Features: Light and simple, Robust customization options and has a free version as well. What sets D3DGear apart is it comes pre-packed with an auto compression tool which lets you save your high-quality videos at lower space consumption rate. And to make it even better, you can have this task of compression done in real time and thus helping you save videos even if you are running low on space. Another advantage is that you have got the option to share your videos over social media channels such as YouTube or Facebook. Also it automatically detects games and connects with them and uses GPU acceleration which reduces the load on CPU. 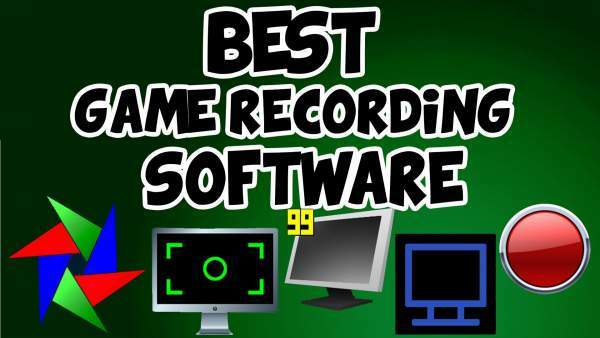 It is one of the best game recording software for video capturing. The velvet black of its user interface is really an appealing one. You ought to try this just because of its UI. That itself is reason enough. Streaming appears to be its forte! You have got a plethora of features to choose from to let have a satisfying experience. Like others, this one also uses GPU for its processing load and helps you keep your CPU free of extra load. You can use features such as, picture-in-picture mode, watermarks, video annotations and social media integration. And not to forget its inbuilt video editor tool which lets you manage all your videos efficiently. Key Features: Robust streaming features, Simple and quick to use and offers free account that provides all basic recording features. Pricing: Free with limited features, Personal subscription for $4.95/month and Premium subscription with added features for $8.95/month. This is a tool with an exhaustive list of features and also supports recording in 4K format. You also get the smallest size possible with its inbuilt compression tool which ensures that you won’t ever have to sacrifice with video quality. The recordings can be adjusted for gaming or other PC activities and the size of the window can be decreased on increased. And you can also record for straight for 24 hours, provided that you have got enough storage space with you on your drive. You can also schedule to record and stop. The feature of social media integration comes in very handy with its one button share option. Just try out its trial pack and if you like it, it’s worth all the pennies spent! It is one of the best game recording software. Key Features: Video Compression, Simple to use with least menu and adjustable window for recording. This one comes with a load of features which make every penny spent worth it. From a simple screenshot to ultra-high definition 4K recording, it has got it all. Use GPU to accelerate recordings, records high frame rates, and put less pressure on CPU. Action! comes with Time-Shift mode which can be extended up to a period of 20 minutes at a stretch. In this mode, your videos can also be edited, like cropping, effects like slow motion and other basic editing features. It also has a dedicated Android app to customize recordings. Pricing: Free trial and $29.95 for Home use and $49.95 for Commercial use. Compatibility: Windows 7, 8, 8.1 and 10. The very look of glowing green in stark black makes you want it even more. This one comes with a load of features to record games and also stream them and yet it is very easy to use. It can record only the last 20 minutes of the gameplay. The biggest advantage you have got with it is that this one is manufactured by Nvidia Geforce, the manufacturers of GPUs installed in most of the PCs. So now you can guess where does it gets its green in black interface. So in integration with Geforce GTX 600 and above, this tool can work wonders. And to top it all up, it comes free of cost!! Key Features: Free, Uses Nvidia Geforce GPU instead of CPU and comes with smart shadow mode. How: Fix 500 Internal Server Error. And now we come to top of our list. There was no doubt that this one was gonna take the honors. OBS has got everything you can ever hope for in game recording software. In fact, even what you can’t! It is the best game recording software. This one has got the option for you to go live on social media handles like YouTube, Twitch, and Hitbox or to save the recording on your system. It can record in MP4 and FLV formats. OBS is considered the ultimate tool for recording tutorials with its features like Picture-in-Picture mode, Custom Watermarks and Push-to-Talk mode. And all this, with no cost involved at all. The developers are in the process to get a version for Mac OS and Linux also. Key Features: Free, Open Source, Simple Interface and Light application. Compatibility: Windows Vista, 7, 8, 8.1 and 10, Version for Mac OS X and Linux is in the pipeline. Many of the above listed best game recording software capture raw video. So, it is recommended to record in the drive with enough space available. Some of them are good for beginners while are good for professional people who want to make a career out of streaming and video game tutorials. Do you have anymore in your glist? Do comment below. Stay tuned to The Reporter Times for latest tech news and articles. Next articleBest Skyrim Console Commands: How To Use Cheats / Hack Codes in Elder Scrolls 5 Game?